Greetings from Japan. In a few days we will be off to the annual Church Planter’s Conference near Mt. Fuji. 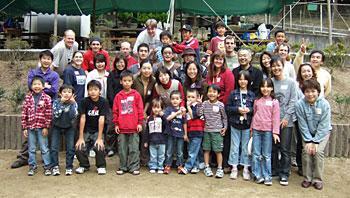 We are looking forward to these 5 days as we gather with over 500 missionaries from all over Japan. This will be a wonderful time of refreshment for our spirits and encouragement for our hearts, and we are thankful for the opportunity to attend. However, by the time you read this prayer letter the conference will be over and we will all be in the midst of the holiday season. Thank you for taking the time to read and pray about the ministry here at SIBC. In late September, we celebrated with Hiromasa Ueda as he expressed his faith through baptism. As a little boy he had gone to Sunday school but had never made a decision to walk with the Lord. After a difficult time in his life, a co-worker (and member of SIBC) began to share the gospel with him. Ueda-san soon put his faith in Jesus Christ. Since then he has been growing in his faith, and his commitment and desire to serve the Lord has been a blessing to many. Please continue to pray for Ueda’s spiritual growth. Please also pray for a new job. His old company went bankrupt and he is currently looking for new permanent employment. A few months ago, Chris began a small discipleship group with a couple of the women in church. Hiromi (one of the women who was baptized in June of last year) and Yuko (who is also Luke’s Japanese teacher) have expressed a desire to grow, so Chris has begun meeting with them every week to teach them the foundations of the Christian life. They have recently finished going through Rick Warren’s “A Purpose Driven Life,” and are now learning how to study the Bible. Please pray for Chris as she guides these women into greater Christian maturity and a deeper relationship with Jesus. November 3rd was a national holiday so we took advantage of the day off to have a church BBQ and do some hiking. We escaped to the local hills for Japanese-style BBQ and a wonderful time of worship & Christian fellowship. William, a young man from Brazil, also shared his testimony with us. After lunch, we set off to conquer Mt. Makio. The hike to the top of the mountain was not so demanding, but exercise was good for us and the view was awesome. 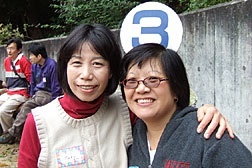 Due to the fast pace of life in Japan, it is often hard for Christians to connect with one another, so these kinds of events are an important part of the life of the church. Recently, there has been a lot of turnover at SIBC. Some old friends have moved on (most have returned to their home countries) and some new ones have arrived (Japanese and foreigners, Christians and seekers). This illustrates the fact that international church ministry is a lot like doing college ministry. We have to accept the fact that every couple of years the face of the church is going to change dramatically. This is good for making an impact on a greater number of people, but it makes it a little hard to build a firm foundation for a church. So, while we are excited about the opportunities to help new individuals in their quest for spiritual growth, at times it can be a bit discouraging that we don’t see more physical growth in the church. The size of the church has been stuck at 35 adults for the last couple of years. Please pray that the Lord would give us wisdom and insight about how to respond to this constant state of flux in the church. Please also pray that these new people would get settled in and would quickly adjust to SIBC as their new church home. On a more personal note, Michael turned 40 in late October. Everyone says that this one is the “biggie,” but Michael feels the same. Luke continues to struggle with kindergarten. He has recently started telling us, “this kindergarten isn’t a good fit for me.” Please continue to pray for Luke. Also, we were able to take a family vacation in mid October. We made a 3-day trip to Tokyo to visit Disneyland and the new Disney Sea. That was a nice time for us. 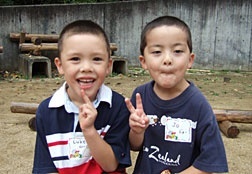 For more of the personal side of our lives in Japan, please make sure to take a peek at the “Photos” section of our homepage (see address below). We greatly appreciate your prayers for us and the ministry here in Sakai. Besides the prayer requests mentioned above, here are some other things that you can pray for. 1) Our Christmas season this year will include two special events. On Dec. 17th we will have a Christmas Coffee House. This will be an outreach event geared towards non-believers. Then, on Dec. 25th we will have a special Christmas potluck after the morning service. This will mostly be for the church family as we eat, fellowship, worship and celebrate together on this special day. 2) Michael has recently started a preaching series on the book of Ephesians. He probably won’t finish this series until after the New Year, so please pray that this would be a wonderful time of learning from God’s word. 3) Finally, we are planning to have another baptism celebration in the spring (we have to wait for the weather to get warm again). A couple of people, including some of the youth, have expressed an interest in being baptized. Please pray for the Lord to lead many people to take this important step. Well, that’s about it for now. Thanks again for your prayers and support. We consider each of you to be a valuable part of the work that the Lord is doing at SIBC.